How long can you keep playing with little plastic building blocks? That’s a question The Lego Movie 2: The Second Part raises twice, both as part of its narrative and by its very existence. Like the questions asked by so many sequels, it’s something that the first movie more or less already answered, with its grown father character (played in a surprise live-action cameo by Will Ferrell) showing that Lego fandom can continue well into adulthood—and that it’s never too late to re-learn how to play, rather than simply collect. 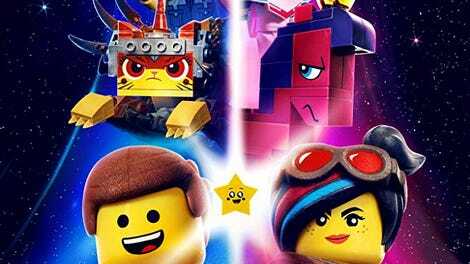 Lego Movie 2 presses ahead anyway, rephrasing the question without deepening it—and without the same craftiness about concealing its parallel, unseen live-action story. Like Brad Bird’s recent Incredibles 2, it follows up a dazzling animated original (all the more dazzling for earning that designation despite being based on a toy line) with some big ideas that don’t cohere with the same streamlined magic as its predecessor. Also like Incredibles 2, the movie nonetheless shows off a great deal of craft. (More so than the fun Lego Batman movie and the more rote Ninjago spin-off.) While Bird specializes in the creation of action set pieces, Lego’s Phil Lord and Chris Miller deal in jokes issued with a toddler’s frantic enthusiasm but a comic’s goofball commitment. Lord and Miller are only writing this time out, having left the director’s chair to Mike Mitchell, but they still careen around this toy world in deceptive control of their abilities. They jump into their sequel straight from the last scene of its predecessor, when the recently saved Bricksburg is confronted by an invasion of toddler-monster Duplo blocks—and then just as swiftly leap five years ahead to the decimated post-apocalyptic landscape the invaders hath wrought. They spoof Mad Max and send the Justice League to their doom with the perfect economy of great throwaway jokes. Everyfig Emmet (Chris Pratt) stays upbeat in the face of these superhero disappearances, dusty landscapes, and sewer babies, while his partner Lucy (Elizabeth Banks) broods darkly over their new status quo (though she does seem to revel in that brooding). When another fleet of invaders arrive, they grab Lucy, along with the previous movie’s supporting cast—Batman (Will Arnett), Unikitty (Alison Brie), pirate MetalBeard (Nick Offerman), and myopically spaceship-obsessed Benny (Charlie Day)—and spirit them away to a far-off planet. Motivated by twin desires to save his friends and prove to Lucy that he can grow and toughen up, Emmet sets off for a rescue mission. Both plots hinge on semi-mysterious strangers: a masked figure takes the kidnapped friends to meet a shape-shifting passel of bricks known as Queen Watevra Wa’Nabi (Tiffany Haddish), while Emmet encounters Rex Dangervest, sort of a hybrid of more domineering Pratt roles (seriously, he’s a raptor-training space cowboy). Suffice to say that the movie’s second level reveals itself earlier and less elegantly than last time, which means that the joke pace starts to slow a little earlier than before, too. Even as the filmmakers make jokes about exposition, they’re indulging more of it. Happily, the jokes still land, and the plastic-looking characters still shine. Haddish’s queen is a particular delight, and the movie, which isn’t quite a musical but definitely leans that way, gives her two original songs, both very funny—not least because one involves an elaborate negging of Batman. The Lego voice-over booths have become a sanctuary of sorts for actors that live-action movies haven’t always served very well: Haddish, Brie, Banks, and Pratt, whose mock-machismo has threatened, in some live-action roles, to fall into garden-variety cockiness. Emmet may prove his most enduring big-screen character. Underneath the expressive voice work, songs, in-jokes, and nonsense cameos, there is some thematic resonance to Lego Movie 2, not fully tapped. As the movie adds characters patterned after the company’s girl-targeted “Friends” line, Lucy chafes at the queen’s glitter-centric lair in the “Sistar System,” and a character describes the post-apocalyptic Bricksburg as “grittier” and “cooler,” the movie seems to point toward a smart, multifaceted consideration of how toys and play can be gendered, whether that matters, and how kids process this as they get older. Ultimately, though, the movie opts for a story that’s cute but far less complicated. As it swerves to avoid the full-on bittersweetness of a Toy Story sequel, Lego Movie 2 starts to feel more prescriptive about a worldview that could be described as “poptimist”—which is to say, open-minded about how people of all ages have their fun... as long as they’re not too “grimdark.” In the first movie, the theme song “Everything Is Awesome” was both wonderfully catchy and an implicit critique of rigid conformity. Here, it’s a gift to the world that you should really just lighten up and admit you love. The thing is, The Lego Movie 2 is lovable. It doesn’t need to rebuke growing up just to get there. Where do they get those not especially wonderful toys?